Fractions, Decimals, Percents on ! 4 DVDs · 7 hrs. 53 mins. 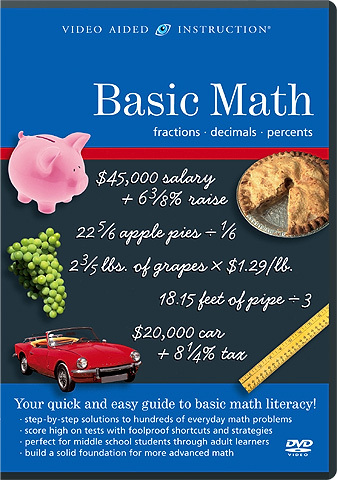 Many everyday situations require basic math literacy — whether you’re following a recipe in your kitchen, sharing a candy bar at the movie theater, making change at a hardware store, or calculating interest at the bank. Although lots of people know their multiplication and division, they still find the basic math areas of fractions, decimals, and percents very confusing. Now you can master these fundamentals — and build a solid foundation for effective calculator use and future math study — with Video Aided Instruction’s Basic Math: Fractions, Decimals, Percents! Perfect for middle school students through adult learners, this extraordinary program features real teaching by a real teacher! Your master teacher’s friendly demeanor and engaging delivery make him easy to listen to and to learn from. And his uncanny ability to explain basic math concepts in plain English makes them easy to understand. You’ll feel like part of his classroom as he works at the chalkboard, showing you the step-by-step solutions to hundreds of problems! Now it’s easier than ever to earn high test marks in school or relearn forgotten mathematics — all with your own private teacher!